You know I love a book when I spend over a week embroidering a shirt based on what was in the book. Seriously, peeps, Shadow and Bone is definitely one of my favorite books of the year. I ADORED IT! And after meeting Leigh, I adore her too! Check out my interview with her, then enter to win! So which came first: writing or costume makeup? Do you have a favorite makeup design? Writing. I was an only child, so my characters were company. I got into makeup and special effects when my dad passed away. I was working as a copywriter and I knew I needed a change or I was just going to fall into the well and stay there. As for a favorite makeup artist, keep an eye on Lottie Star. She's always doing incredible work, and I think she'll be one of the big players in runway and editorial in a few years time. In the UK Shadow and Bone is published as The Gathering Dark. Have you had much involvement with your UK publisher? Do you know why the two countries decided to have different titles? We did a separate set of edits for the UK version so I've had some contact with Orion/Indigo. (There are actually some very minor differences between the UK and US versions. Just a few sentences, but they're there!) Also, my UK publicist (Nina Douglas) is way too much fun, so we chat on twitter all of the time. But I had very little involvement with the way the book was packaged in the UK. I think they chose The Gathering Dark because they felt it would stand out in the UK market. Aside from edits, what did you do after your book was picked up by Henry Holt? Do you have much input in the cover? Trailer? Etc? Revisions and edits were definitely the big thing. I gave input on the map (and contributed the hilariously bad sketch I'd done while working on the book). I didn't have a lot of involvement with the cover and trailer, but I will say that when I gave feedback, I always felt listened to. Also, I was blown away by the end product for both the cover and the trailer, so I have zero complaints. Can you tell I love my publishing house? Books two and three already have titles! Did you already have those titles in mind when you wrote Shadow and Bone? Do you know what the UK titles will be? I had titles in mind for all three books and they all changed. I wrote a post about the evolution of the title of Shadow and Bone here. Luckily, the titles for book 2 (Siege and Storm) and book 3 (Ruin and Rising) clicked right away. In the UK, Book 2 will be The Shadow Fold. I haven't yet heard the title of Book 3. Russian culture was clearly an influence on Shadow and Bone. Are there any other cultures you love? Perhaps some that might influence a future book…? Some of the action of Siege and Storm takes place in Novyi Zem, which was loosely inspired by colonial America, Australia, and to a lesser extent, Brazil. I'm thinking about setting my next series in Ketterdam, the capital of Kerch, and that would have some Dutch and German influence. We'll see. Research is always a point of departure for me. I'm never sure where I'll end up. Mad lib time! Credit for this idea goes to Everead! pudding! Why hadn’t I thought of it before? Why hadn’t they thought of it before? …why not a pudding of my own like Ivan’s thief or the sigh I’d seen hanging around Marie’s kneecap? Oh my heck I loved this book!!!! It's also one of my favorites for the year. I like the title and cover for the UK version too. I can't choice which I like more. They're both great! Love that she used cultures to influence her books! That is interesting that the books take place in several different cultures. That sounds difficult to write/research but awesome to read! Oooh. I am ridiculously excited to visit the new countries. An American/Australian/Brazilian mishmash sounds awesome. Loved the interview! It's cool to hear about the changes and I love both of the covers, they're just so amazing! I guess I should have gathered the Russian based society from the cover. I'm way excited to read this! I've heard nothing but greatness! Loved Shadow and Bone! Can't wait to read the sequel. I loved this one too! The Russian influence was so interesting -- can't wait to read the next ones. I've seen this at my library, but haven't checked it out yet. Maybe I won't have to now. Ooohoh, I've wanted to read her books for a long time!!!! SO COOL!!!! I absolutely ADORED this book! I have read it twice already and I plan to read it even more in the future. It's seriously that good! I really like the UK cover art. It's beautiful! I look forward to reading. i actually NEVER saw the UK cover!! i REALLY loved Shadow and Bone, but the UK cover is a no no. I really like the US cover waay more! And i never knew her dad has passed away... God bless him. Great book. I Loved all the Russian Lore. Ooh, I just got this from the library because I heard it was fantastic! I'm so excited to read it. I really need to read this book! I keep hearing it's amazing! It's so cool that a book suddenly gave you the oomph to start embroidering a shirt! I've been wanting to read Shadow and Bone for the Longest time, and am absolutely jealous that you got to interview Leigh Bardugo!!! Fun interview! I've been wanting to read this book. I've heard lots of good things about it! Wow! I'd really love to read more about Russian culture! 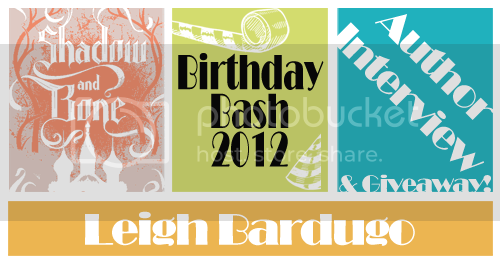 It's very awesome of you to spend time researching about it, Leigh! I love the titles to all the books. They go so well with each other. Great interview. Thanks for the interview! Interesting that the US and UK have different titles. wow the US and UK both have great titles. 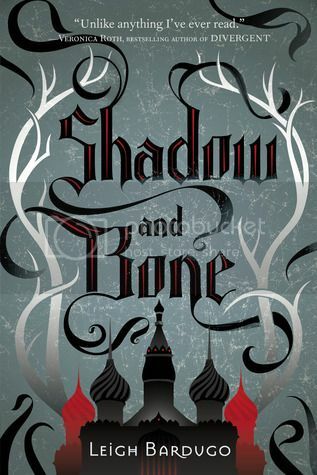 makes me want to buy the series in both editions... Really excited to read Shadow and Bone! I LOVE the UK cover!I always assumed that since both US and UK speak English, that both versions would be the same, aside from the cover and titles. I had no idea that sometimes the sentences are different. I read this as an ebook and it was AWESOME! Loved it! I've also heard that it's becoming a movie and that the producer is also the producer of the Harry Potter movies! Awesome interview! I loved Shadow and Bone and you can just tell how much work she did to make the book great! WOW makeup design. My daughter is addicted to makeup and wants to do something to do with makeup/fashion when she is older. She will graduate high school with her cosmetology license. Right now it is just a struggle to get her to try not to look older than she is! I am always amazed when I hear/see someone's work is titled differently in different countries. I haven't read SHADOW AND BONE yet. I must & soon. This interview was so much fun to read. I read Shadow and Bone and absolutely loved it. I didn't know that it was published under a different title in the U.K. though!